To round up our celebration of women series, we spoke to Leah Alexandra, founder of Leah Alexandra Jewelry. Make a smoothie (always), have a coffee, go for my am workout, head to the studio where we’re working on a million things at once, head to home for dinner with my pup Luca and husband Kris, work some more and do it all over again! The jewelry hustle is real 😉 I do try to break it up with travel when I can- I’m taking a quick trip to Baja next week which is just what I need to relax and unplug. – What made you interested in jewelry? I’ve been passionate about jewelry for as long as I can remember and have always loved using it as a way to express personal style. I became very fascinated by gems and never turned back! While finishing my degree, I became particularly obsessed with turquoise stones. I set out to source a wholesale dealer and that led to the creation of my first experimental pieces. – When + what made you decide to launch your own brand? I’ve been making jewelry for almost 2 decades but it was 13 years ago that I decided to take it seriously as a full time business. I cashed in my savings for gemstones, and started meeting with buyers! Fast forward to 2018 and I have an amazing team, international stockists and a growing group of customers from all over the world. 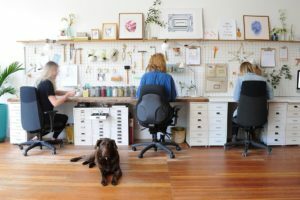 – How did you go about picking a location for your studio + showroom? I worked from home for quite a while. At first, it was a tiny table in our studio apartment, then we moved to a one bedroom, then to a two bedroom where I had my own “room”. Just over 4 years ago I finally got my own studio + showroom. It’s a heritage space in the heart of Gastown with loads of character and natural light. I love being at the centre of all the shops, restaurants and bars in this vibrant neighbourhood – it keeps me inspired. – What do you wish you’d known before starting Leah Alexandra Jewelry? I wish I had known not to be afraid to take risks. Some of my most rewarding experiences as a business owner and designer have been when I took a leap, not knowing if it was the right move or how others would react. You never know if you don’t try! Don’t stress and don’t be hard on yourself – you’ll figure it all out as long as you stay ambitious. To be happy, healthy, surrounded by people I love, and to travel frequently all the while! While I wish I could say the newspaper… I’m on my work email as soon as I’m up and about. Ask for Luigi! Lunch or dinner- the pasta is to die for and its got such a great intimate feel. We’re just about to launch our spring collection which I’m super excited to share, but I’m keeping our Armour Necklace, and Rainbow Ring on constant rotation. We also recently launched the ‘Estate’ collection which is made up of vintage lockets I’ve collected from my travels that reflects my love of all things antique. Vancouver has such an inspiring community of entrepreneurs that I love being a part of. Myself and the team love Vitruvi, Woodlot and Nectar Juicery to name a few. Besides Gastown, I love Kits! I feel like the neighbourhood is such a good representation of everything Vancouver has to offer in terms of stores, restaurants, the outdoors, and friendly faces. AM! I like to start the day off right and get my blood flowing. I do an AM workout twice a week with a person trainer doing high intensity interval training and alternate different classes on the other days. I love travelling and have about 10 dream vacations on rotation at any given time. Currently I am dreaming of going to Havana- I want to experience their culture and take some beautiful photographs. Is it bad to say my iPhone? It keeps me connected to my business and all the people I care about! So if I’m being real… iPhone = life. 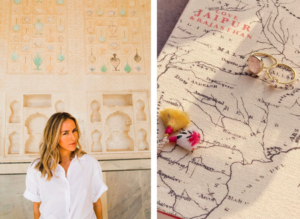 Follow Leah’s adventures as she finds inspiration for her collections around the world. To learn more about Eliza’s work, take a look at her website.